Coverage: Live on BBC Two, Radio 5 live, 5 live sports extra, online, mobile, the BBC Sport app and Connected TV. England women's coach Mark Sampson has insisted that the Wembley surface is "not a bad pitch" ahead of his side's friendly with Germany on Sunday. Roy Hodgson last week questioned the decision to stage an NFL game at the stadium just six days before Saturday's Euro 2016 qualifier with Slovenia. And Wembley managing director Roger Maslin conceded the pitch will "not be of the very highest standard". But Sampson said: "Compared to the ones I played on, it's not a bad pitch." He added: "Some of these girls used to play on pitches in December and January in the old Women's Premier League, and this is a long way better than those were." 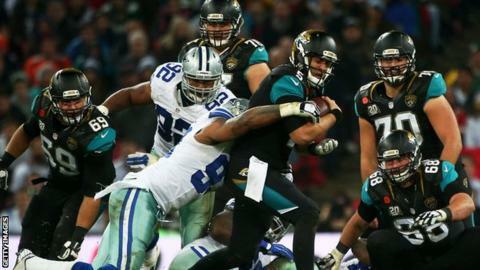 The turf was cut up during Sunday's game between Dallas Cowboys and Jacksonville Jaguars. A record attendance of 55,000 is expected for the first England women's match to be held at Wembley.